When a jaded Dublin theater critic abandons his ordinary life in pursuit of a beautiful young actress, his desires lead him to strike an irreversible bargain with a band of modern-day vampires. Olivier Award-winner Brendan Coyle ("Mr. Bates" of Downton Abbey, Mary Queen of Scots, Paths to Freedom) stars in this intimate thriller by Conor McPherson-"the finest playwright of his generation" (The New York Times) and author of Shining City, The Weir and The Seafarer. A limited engagement direct from London's internationally renowned Donmar Warehouse. "...So in some ways, this theater critic is a dinosaur, never held accountable by embittered artists on Facebook as he ransacks Dublin theater according to his whim and how much Jameson had passed his lips. In others, he is very much of this moment, especially as played at the Goodman Theatre by Brendan Coyle, best known for playing Mr. Bates on the long-running British TV series "Downton Abbey."" "...Directed by Simon Evans, Coyle (best-known for his Job-like sufferings on �Downton Abbey� as the beleaguered and endearing valet Mr. Bates) is all-in as the dissolute critic. But despite his creepily compelling work, �St. Nicholas� is essentially the story of a self-indulgent mid-life crisis of a mediocre man. And that is just not terribly interesting, even with vampires." "...Coyle ("Mary Queen of Scots," "Me Before You") isn't just an impeccable actor who seemingly connects with each audience member individually; he's a superior storyteller of McPherson's perceptive, highly descriptive and sinister (almost horror) tale. Coyle makes this detestable, desperate individual alluring. Something about this deeply flawed man must engage us, and Coyle finds it. There's a suggestion of neediness early on, but there's no self-pity in Coyle's expertly paced, unobtrusively self-aware performance, which he conveys matter-of-factly." "...There's nothing obvious or heavy-handed in Coyle's performance (directed by Simon Evans), which brings out many witty shades in his dissolute-but-desperate hack. He's a clinical and sardonic observer, even�or especially�of the critic's own human failings. But he also makes us believe that it's possible to reject the easy path of conscienceless cynicism for the darker, deeper journey toward meaning." "...It's impossible to deny that St. Nicholas offers an uncharitable view of theater criticism. And yet, for this critic at least, it evokes a pang of nostalgia. The critic in this play has a job, after all, and it's a cushy sinecure at that. Two decades ago, St. Nicholas might have read like an attack, but for today's lowly freelancer or harried critic-reporter-editor-receptionist-adman-janitor, it now has the air of an elegy. Critics! Remember critics? They were the worst." "...Still, the wordiness of McPherson�s play confounds it fore and aft. Where the first act wanders, the second part turns redundant and thin, and finally hollow in a closing homily about the power and truth and human commonality of � wait for it � love. This from a cynical, curmudgeonly narcissist. In this show, love is just a four-letter word. Like bite." "...As the self absorbed monologue continues, it becomes obvious that it isn't the nature of the Dubliner's job that is significant; this is an obsessively drawn portrait of obsession itself. Not to put too fine an analytical spin on it, the author probably intends to compare critics to bloodsuckers who feed on the vital force of the living; our inebriated hero advises us that he was dead in spirit before he met the Nosferatu gang. We are in the presence of a deeply disappointed individual who has gloried in his imagined power over others, who writes reviews before he's seen the plays, who lies about the substance of his opinions in order to win an actress' affection. No wonder he's estranged from family, colleagues, mental health and self esteem!" "...St. Nicholas is a play where McPherson hopes that people will eventually find their way and look into the mirror of their consequences and actions and deal with the things they see. Many of us, not willing to see the real Brendan Coyle in us all will refuse to self-examine our actions and will only see a blank reflection." 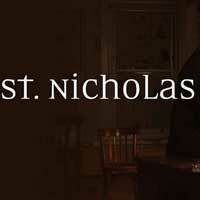 "...The intimate "Black box" space, Owen Theatre, at The Goodman, is playing host to a special engagement's revival of "St. Nicholas", written by Conor McPherson and starring Brendan Coyle. This is a special performance-art, one man show that will not appeal to all audiences. The "monologue" play deals with vampires and what takes place if bitten by them. Directed by Simon Evans, we are listening to Coyle for close to two hours ( with one intermission) as he tells us his thrilling and chilling story about reaching out to a lovely lady who has drawn his attention . Our "hero" is of all things, a theater critic, which drew a lot of laughs at last night's "press opening" with a house filled with theater critics/reviewers." "...Without any histrionics, and with meticulously calculated pacing, Coyle proves he is an ideal interpreter of McPherson's twisted, bitingly observant and ghostly psychological/spiritual road trip. And he expertly sustains the narrative even in those moments when the trip seems a bit too long and repetitive." "...This production may not be for everyone. It will certainly appeal to fans of �Downton Abbey�s� Brendan Coyle, as well as devotees of the works of Conor McPherson. But it�ll also delight the theatergoer who enjoys going on a journey with a skilled storyteller. The Irish playwright is particularly known for dramas that feature a touch of humor and a hint of the supernatural. Some of his other plays include �The Weir,� �Shining City� and �The Seafarer.� In �St. Nicholas,� McPherson presents us with an antihero who discovers that, because of his unpleasant personality and profession as a theatre critic, he�s also one of the undead." "...Overall, fans of "Downton Abbey" in general and Brendan Coyle in particular should be satisfied with "St. Nicholas" in its Donmar/Goodman form. Others may be bored by all the well wrought language that takes often takes the listener no place in particular. Still, we probably won't be privileged this season to be exposed to any performance more rewarding than Coyle serving up his deliciously hateful drama critic"
"...SAINT NICHOLAS is a trifecta! The writing, directing and acting combine for storytelling perfection. It blurs all the lines between reality, fantasy and delirium." "...I guarantee you that St. Nicholas will give you plenty to talk about when you have an after-theater libation with your friends. And that inspiration to discuss a play afterwards-whether for good or ill-is one of the great charms of going to the theater. Also if you happen to hate theater critics, St. Nicholas is for you." "...Audiences may ask themselves if the blood-sucking vampires of the second act are supposed to be a metaphor for how some people, including critics of any of the arts, seem to prey on actors and artists in order to stay alive and collect a paycheck." "...Coyle is absolutely brilliant in the role of the critic. His commanding presence and deep, Irish-tinged voice make for the kind of mind control the vampires have: you are compelled to watch and listen even though this character isn't much of a human being. He can fascinate simply by walking across the stage, and director Simon Evans takes full advantage of this in a moody, slow-paced production punctuated by small manic actions like Coyle slashing across the stage to fill a glass from a water bucket. And if the first act-the set-up in which we learn of the critic's life and meeting the actress-might plod a little, the second act, involving the vampires, more than makes up for it." "...Coyle's quietly commanding performance is a monumental undertaking over the course of two acts in the Owen, which at 450 seats is nearly twice the size of previous mountings of this piece. Bubbling with the nuance of an exceptionally skilled actor, Coyle chews up McPherson's sprawling narrative, his fear and frustration palpable in the face of the evil presence that hangs in the air like a heavy dew." "...Brilliant acting and a striking stage design make St. Nicholas, in this writer's opinion, a fascinating event to watch unfold."